I must admit, We Are Here caught my eye primarily due to the title’s uncomfortable similarity to a certain large-scale project I’ve been working on for the past twelve months. I read about it because I was annoyed, I decided to go because it looked really good. A symposium/conference of sorts for artist-run initiatives (ARIs) in Australia, We Are Here was conceived of by the National Association for Visual Arts (NAVA) and Firstdraft, and supported primarily by the Australia Council for the Arts. The events, a mix of presentations, roundtable discussions and excuses to drink, ran Thursday September 1 to Sunday September 4 in Sydney, largely and generously hosted by Queen Street Studios. I hit the highway with artist and arts agitator George Rose – a talented lady who is five times more motivated than myself. Together we flew the Canberra flag, among a truly national representation, with delegates from far-flung cities and towns (Cairns, Launceston, Cootamundra et al) seemingly out-weighing the expected Melbourne/Sydney contingent. And they are all doing incredible, enviable things within their communities. If we compare ourselves to national trends and the definition of ARI that prevailed at We Are Here then it’s safe to say that Canberra doesn’t really have any to speak of (the nomadic Here & There Collective being the closest example). Making friends within these other ‘small-time’ scenes such as ours, and having frank discussion about the nature of arts activity at home George and I were forced to admit that Canberra’s problem still is largely one of complacency and lack of self worth, coupled with a crippling fear of risk-taking (I am as guilty as anyone). We can try and cover however we like (the city’s too small, there’s no old buildings, there’s not enough funding), but they remain convenient excuses. Far from being depressing, this realization, in the context of the symposium, was in fact wholly motivating. The only disappointment was that more Canberrans hadn’t attended, particularly given our proximity, with whom we could carry this energy back to our own city. Overall, We Are Here was an awesome event, and is sure to remain one of my top ten arts events of 2011 (thanks to George for dragging me out the door when I couldn’t bear to have another trip away). It was well run, well catered (important! ), affordable and refreshingly free of any art-world posturing. There were so many light-bulb moments, so many gems from the many incredible presenters, and swathes of inspiration. I tweeted as many of these as I could bear to during the event, and for anyone interested in the discussion that took place during the symposium the Twitter hashtag #wearehere will provide the highlights package from NAVA and other smart phone toting delegates. 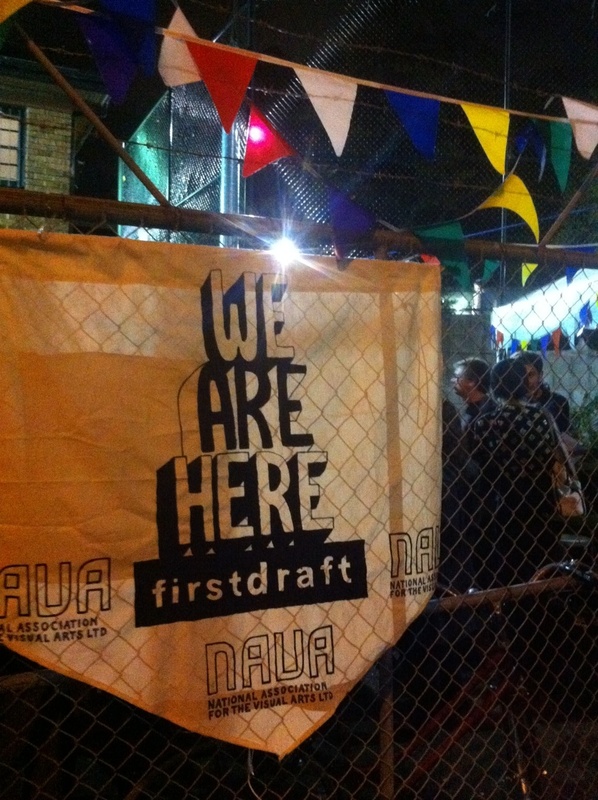 Congrats to NAVA, Firstdraft, Queen Street Studios, all the presenters and volunteers. Let’s do it again sometime – I promise I’ll have more to tell.